This entry was posted in Guest Writers and tagged Abby Fendler, education, Family, friendship, growing older, in memory of Ronnie Frazier, Louisiana, Metairie Louisiana, Metairie Park Country Day School, MPCDS, New Orleans, Ronnie Frazier, teaching, writing. Bookmark the permalink. It was my experience that cafeteria staff, security monitors and custodians are just as much a part of a school as the teachers, who often forget this. They were also part of the neighborhoods and their children attended school as well and relationships extended into the churches too. People like Ronnie give a school a sense of family. I’ve known a lot of Ronnies and they were better friends than most of the teaching staff. The only people that are useless at a school are the principals and assistant principals. Sounds like a great guy and a life well lived. The guy I come up with is a scout or cub scout leader, can’t remember which, who left a lasting impression of decency, integrity, service and activity – actually doing things. I had kind of crossed a religious divide (in a place where that mattered) to take part and recall the subtle quiet important efforts he made to ensure I fitted in and felt comfortable. He stays in my mind decades later. What a great post and very familiar. My hero was when I was in 3rd grade…the janitor at Sibley Elementary School in Michigan. Everybody just loved Vern! He was awesome. He was goofy and he would play with us. He always walked around with a entourage of little kids…nagging at him to show a goofy face or do some magic. His favorite was finding pennies behind your ears. We just loved it! Ronnie was beyond! 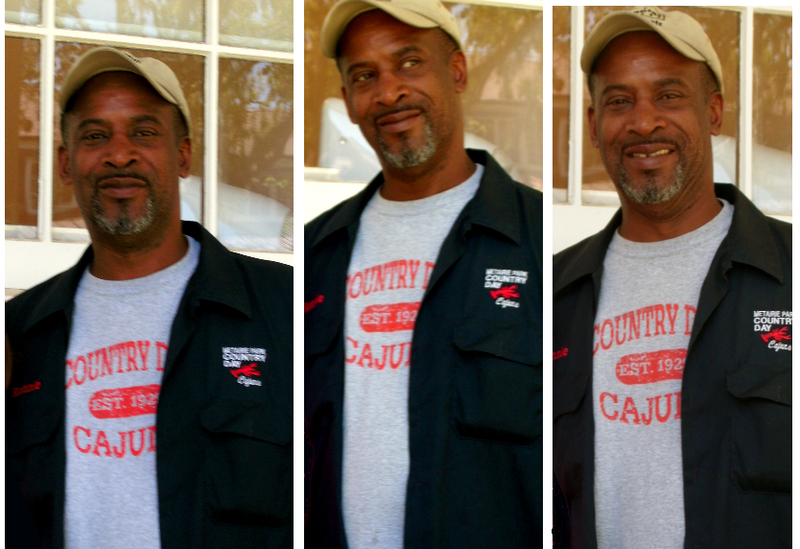 When I was a new teacher – a Yankee living in Louisiana – Ronnie helped me with everything. He helped me figure out how to get a heavy carpet into my room (to make things cozier), and when I got the idea to have my students paint my old, ugly, clunky metal desk (in a symbolic way, with scenes and quotes from books we read together), Ronnie wrastled up brushes and paint. He also helped me deal with some fiery students and taught this North Eastern girl to s l o w d o w n. He knew everything about everyone, and he really knew how to read people. The last time I was in NOLA, back in 1999, I just happened to be downtown and I heard a horn honk. It was the MPCDS bus, out on the town on some kind of field-trip. Ronnie – somehow – recognized me amidst the sea of faces and pulled over the bus to catch up for a few minutes. He was just that way. He really cared about people. Billy Joel sings, “Only the good die young.” That Ronnie. Man, he was too good. He will be sorely missed. Maybe they were always too wrapped up in their own problems?? Wow, I just found this. I wanted to see if there was anything about the death of my father so I googled his name. I came across this beautiful tribute to my father. Thank you for the tribute to my father; it moved me to know that he was beloved by students, teachers and faculty. He loved his job and the students. He would always speak very highly of the students and how they would make him laugh. I going to miss him so bad and the thought of not being able to pick up the phone and talk to him hurts my heart. Again thank you and may God bless you. I’m so glad you found my blog. I had been Googling all week, too. Being so far away from New Orleans, I felt alone with this and I figured it was time to take matters into my own hands. I was especially grateful that Abby Fendler had written something and gave me permission to use it. I am sure this is a difficult time for your family and I’m sure something will eventually appear in the Times-Picayune. Like you, I will be looking for it. A more private message is on the way. I write this through tears but am glad so many others can learn of this kind, gentle, and caring man. Many times in our society we look past people and look down on certain jobs and professions. Ronnie made this impossible not only because of his shear physical presence but also because of his enormous personality. He and his wife Rubie, who also works at Country Day and has for years, were two of the people I sought out on every trip home. I know his family both biological and extended will feel this loss forever, but I hope like me they will be able to push pass the hurt of this loss and remember the image of his warm, ear-to-ear smile and the memory of the way he lite up when he saw you as well as his huge bear hugs. Ronnie will be missed. Ronnie was the guy who loved you when you didn’t love yourself, and weren’t sure anybody else loved you either during the most awkward years. He was my friend, my cheerleader, my rock and the face of grace. When people talk about the South and a “true Southern gentleman,” they’re talking about Ronnie – whether they realize it or not. When I didn’t have a dad, Ronnie was the father-figure I needed – always there with a pat on the back, a hug, words of encouragement and sometimes just the silent presence of a true friend. When I saw him earlier this year – for the first time in a while – it was as if no time had passed. Time, now, may pass without him on this island, but no time will pass without him in my – and our – hearts. I love you Ronnie, and will miss you. Matthew, thank you for taking the time to write something. You are absolutely right. Ronnie was the epitome of a Southern gentlemen. Of course, he ended up with Rubie. She, being the epitome of Southern hospitality and grace. We are so lucky to have known him. I haven’t seen or talked to my uncle Ronnie in years (I grew up in Missouri, now live in Los Angeles), however I remember as a young child visiting Louisiana for vacations and spending time with him. He gave me some advice when I was about 10 or 11; sadly I never took the advice and struggled for years in my twenties. I never got the chance to tell Ronnie thank you for that advice, but I have since passed on his advice to the youth that I encounter here in Los Angeles.. I want to say thank you Uncle Ronnie, and may god bless your wife and kids and keep them safe!! Tim, it is nice to receive your words. I only knew your uncle for a few years myself, but I’m starting to understand that no matter how much time Ronnie spent with someone, he left his mark. As long as you pass on his knowledge, his words will stay alive – as will his memory. Peace be with you.